Credit: ESA/ISO, ISOCAM Team, I. F. Mirabel and O. Laurent (CEA/DSM/DAPNIA), et al. 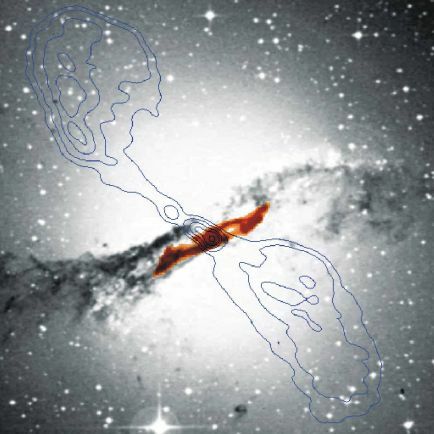 Explanation: Deep inside Centaurus A, the closest active galaxy to Earth, lies ... another galaxy! Cen A is a giant elliptical galaxy a mere 10 million light-years distant with a central jumble of stars, dust, and gas that probably hides a massive black hole. This composite combines an optical picture of Cen A with dark lines tracing lobes of radio emission and an infrared image from the ISO satellite (in red). The ISO data maps out the dust in what appears to be a barred spiral galaxy about the size of the prominent nearby spiral M33. The discoverers believe that the giant elliptical's gravity helps this barred spiral galaxy maintain its shape. In turn, material funneled along the spiral's bar fuels the central black hole which powers the elliptical's radio lobes. This apparently intimate association between two distinct and dissimilar galaxies suggests a truly cosmic symbiotic relationship.